Whenever I buy a jar of marshmallow fluff for a recipe I end up eating the whole jar - not in one go, but it doesn't usually end up being used in the recipe I intended! This time around I bought two jars so I could definitely make the recipe I wanted! 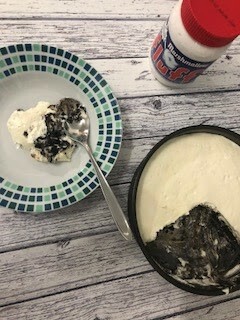 My husband loves Oreos and I decided to make an Oreo cheesecake and use the marshmallow fluff in the filling. I kind of made the recipe up as I went along and it didn't set particularly firm - you need to eat this with a spoon rather than a fork - but it tasted really good! Crush the Oreos either with a rolling pin or in a blender. Melt the butter in a small pan over a low heat or in the microwave and stir in the crushed Oreos. Press into the bottom of a 7 or 8 inch loose-bottomed cake tin. 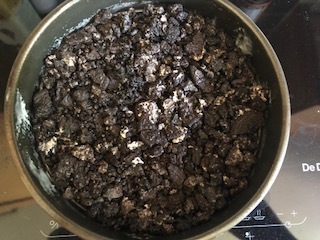 In a large bowl, mix together the marshmallow fluff, soft cheese, crème fraiche and icing sugar and spread over the crushed Oreo base. Allow to set in the fridge, ideally overnight. I'm sharing this with Baking Crumbs and Casa Costello's Bake of the week (even though there is no actual baking involved!) 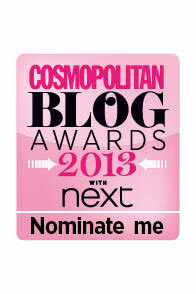 and CookBlogShare.